ID: Transparent white body with pink internal �filament�. Usually grows in dense colonies. Comments: I only note the spectatcular lightbulb ascidian in the Cape Flattery area. There are several small colonies of this ascidain thriving at Mushroon Rock. 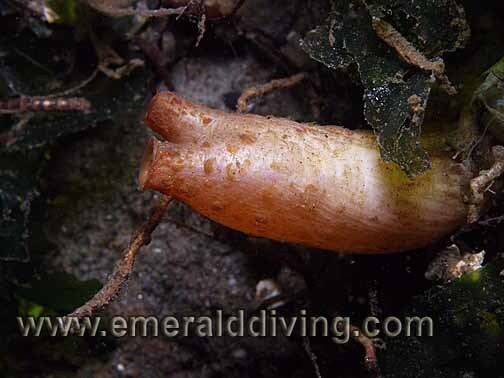 ID: Mushroom shaped ascidian, often with a "stem". Coloration varies greatly. Comments: This bland looking ascidian often just blends in with everything else. 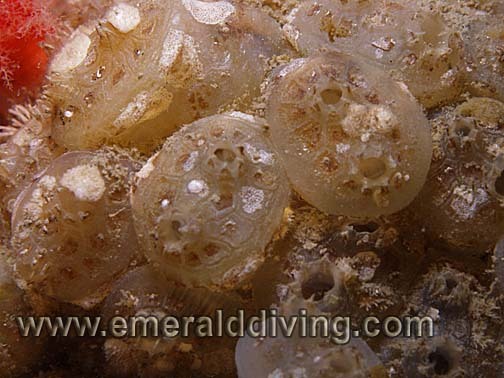 When I purposely look for this ascidian, I am amazed how prevalent it really is. I readily find this ascidian anywhere there is ample structure for it to gain a solid footing. 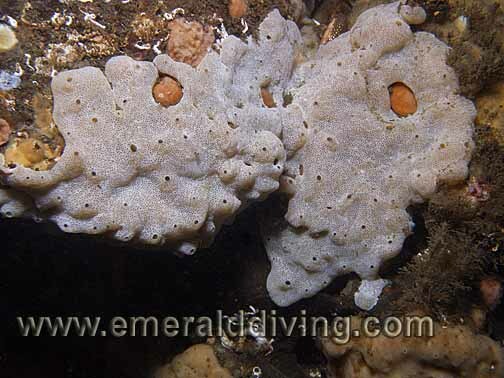 ID: Encrusting ascidian that forms rounded and uneven lobes. Colors includes whites, pale yellows, and pale pink. Never purple. 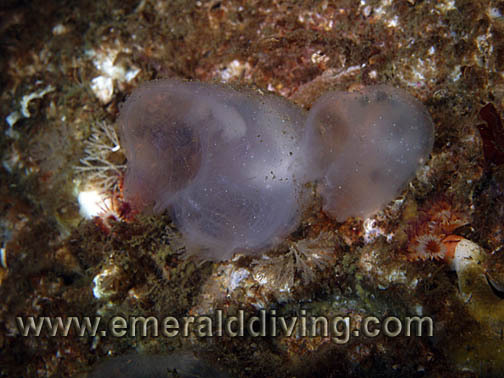 Comments: This is a common ascidian in the San Juans and Cape Flattery area. 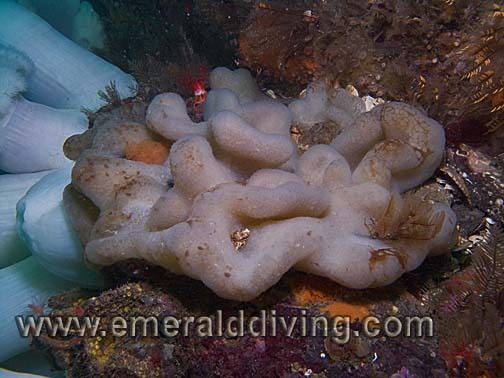 This lobed ascidian encrusts rocks areas of strong current and can grow to a rather large size. ID: Unique flower-like clusters. Color can be orange or light ornge. White variation is a different species. Comments: I have note this species throughout the San Juan Islands and Cape Flattery area in "clean" current swpet areas free of silt. This photograph was taken at Long Island West Wall in 80 fsw. ID: Small bright orange round bodies with two valves. Tends to grow in dense colonies. 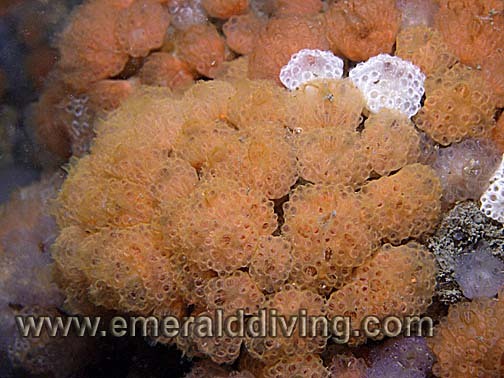 Comments: I often find these ascidians clinging to walls and the underside of ledges when diving the San Juan Islands or Cape Flattery area. Without light, the look drab and uninteresting. However they explode with color the moment I shine my HID on them. 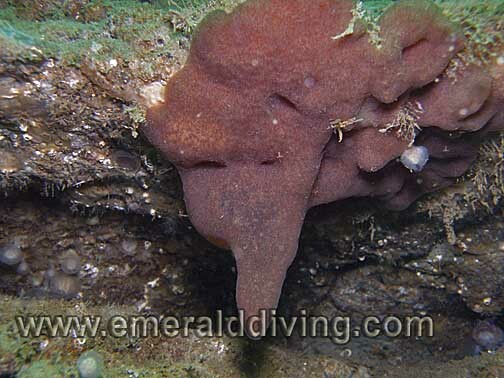 ID: Encrusting ascidian that forms rounded and uneven lobes. Colors is purple or light purple/lavendar only. Comments: Similar in appearance to Cystodes lobatus, which is never purple (see above). Gretchen Lambert (aka Dr. Tunicate) distinguished this speices from Cystodes lobatus. ID: Orange, lobed structure with folds and dark patches on exterior "crust". 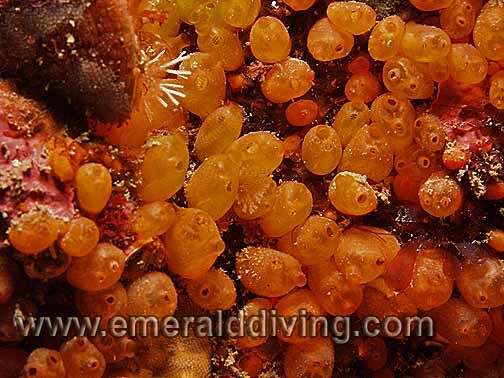 Comments: These small ascidians are tightly packed together and somewhat resembled the lobed ascidian. This ascidians prefers costal areas subjected to high surf. Photo taken at Duncan Rock in the Cape Flattery area. ID: Cluster of small, rounded white mounds with many small holes and distinctively larger pores. Mounds are often isolated, but sometimes run together. Comments: I often note this low-profile but interesting looking ascidian in rocky current swept areas through the San Juan islands and Cape Flattery area. These colonies can span large areas several feet across. ID: Opaque tubular body with two valves at the top. 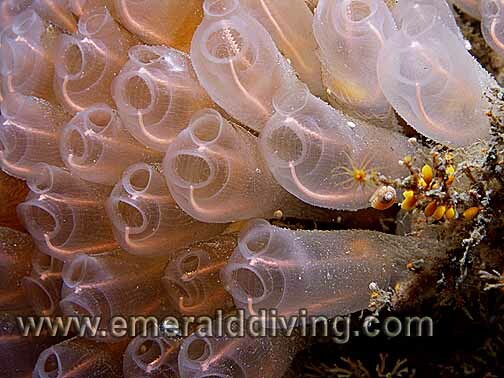 Comments: I often note the glassy sea squirt when diving the San Juan Islands, and occasionally note it elsewhere. 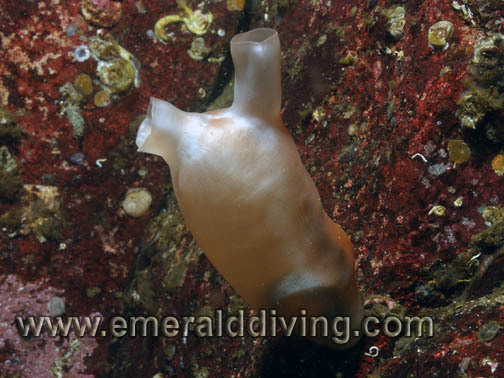 This sea squirt can grow quite large and has two large, distintive siphon holes it uses to filter feed. ID: Red to brown color. Short hairy spines. May or may not have a stalk. 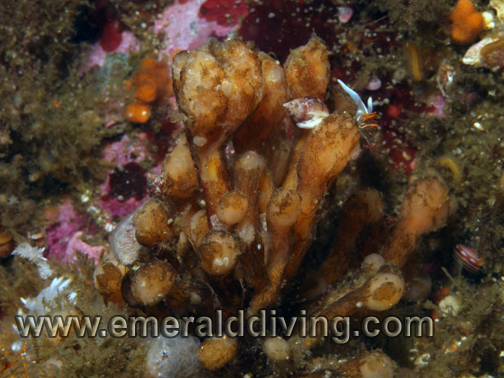 Comments: The hairy sea squirt is very common throughout Northwest waters. I often overlook this small and drab colored se squirt. 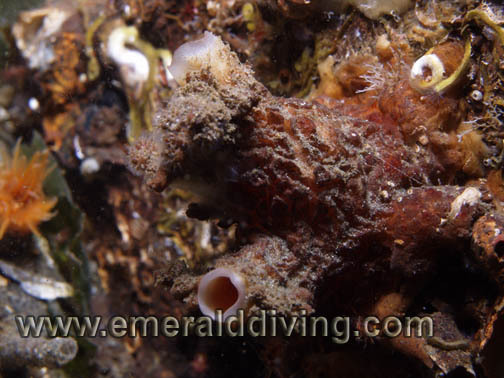 Note that the opening of one of the hairy sea squirts siphons is square in shape. ID: Orange siphons, one that extends much further than the other. Comments: I have only noted this ascidian in the Cape Flattery area, where this photo was taken. This ascidian is often totally encrusted with other invertebrates. When the siphons are retracted, this ascidian is almost invisible. 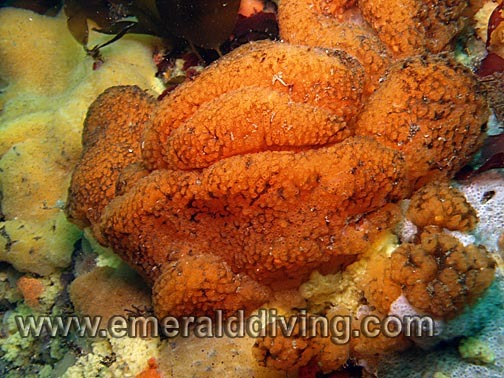 ID: Sprawling compound ascidian. Spreads unevenly across rocks. Color varies significantly, but typically orange or yellow. Comments: I only commonly note sea pork when diving the Cape Flattery area. I have to ask - why "sea pork"? "Soft yellow lumpy stuff" would be much more descriptive. ID: Opaque white lobes with red or orange-red ended pores (zooids). Typically rounded shapes. 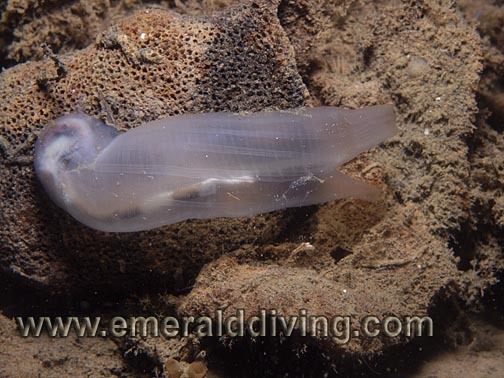 Comments: This tunicate is common throughout Northwest waters. Most specimens I note are rather small. However, I often note large and hearty specimens in the Cape Flattery area. Some areas around Cape Flattery sport fields of this ascidian scattered across a rocky ledge. 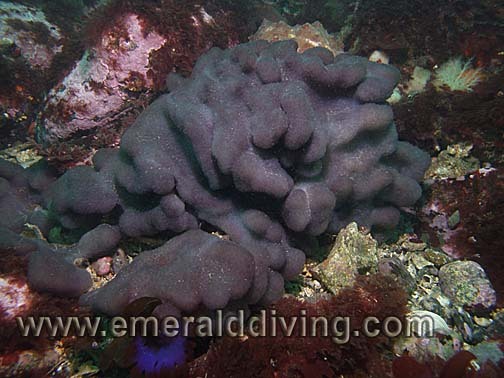 Typical size: Sprawling ascidian, often 10" or more in diamter. ID: Lightly speckled apearance. Purple-red in color. Often forms stalactite-like shape. Comments: I rarely note this unusual ascidian. 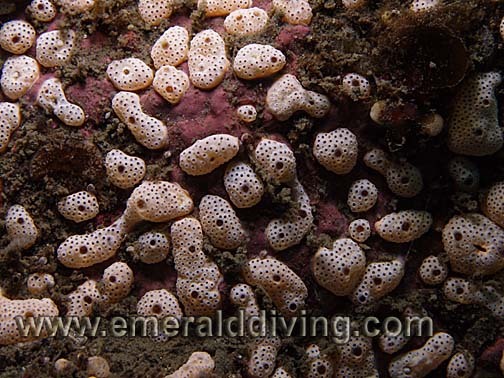 I have found several speckled compund ascidians hanging on the underside of ledges along Possession Point Fingers. Typical size: Variable size, often 20� or more (width). ID: White color, porous with stubby mounds. Maintains a relatively flat profile. 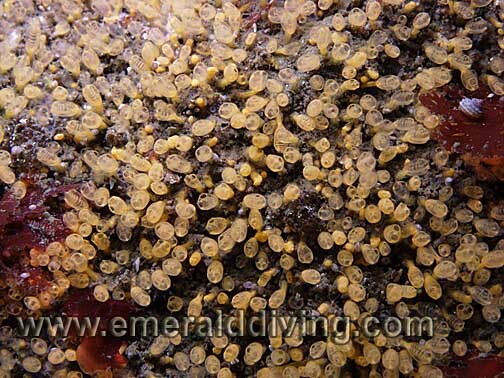 Comments: I commonly note this sprawling ascidian on most walls and current swept reefs. ID: Round in shape with two siphons. Can be yellow or white in color. Grouped together in loose clusters. 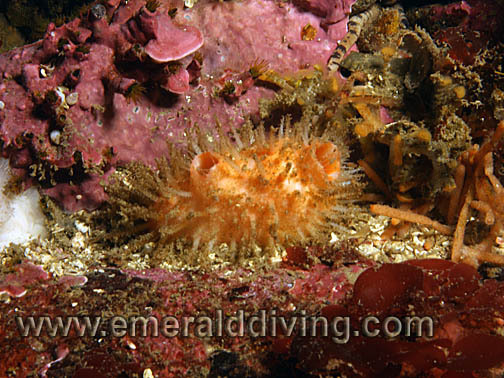 Comments: These bight little ascidians cover vast expanses of rocky reef in most current-swept regions around the Cape Flattery area. Comments: This photo proves that everything isn't in a name. 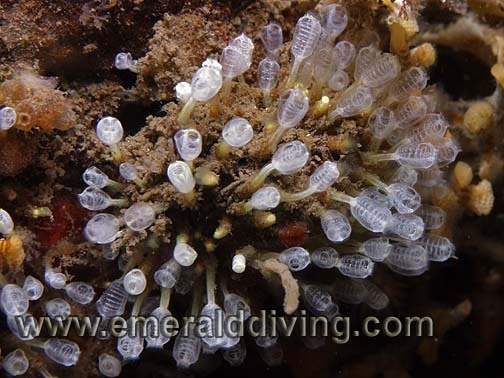 These ascidians are of the same species as above, only they are white. Photograph taken at Long Island in the San Juan Islands. ID: Flat and hard round top. Both siphons raised. Yellow to brown color. Typically noted on dense congregations. Comments: I only note this ascidian in the San Juan Islands, where it can be extremely prevalent. Sections of the rocky reef at Cone Island are covered with disc-top ascidians. 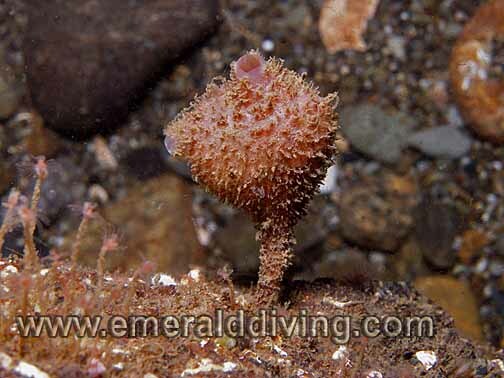 Also referred to as a horseshoe ascidian. ID: Stalked ascidian with paddle-like head. Typically orange, brown, and/or yellow. Comments: This ascidian thrives in exposed locations. Sections of the area around Duncan Rock are literally covered with this ascidian that appears to proper in heavy swell. ID: Typically red, but colors can include yellows and whites. Comments: A common ascidian found in the Cape Flattery area, less-so in the San Juans, and seldom elsewhere. This ascidian has a less rounded appearance than the red-dotted ascidian. The zooids of the red ascidian protrude less than the zooids of the red-dotted ascidian. ID: Narrow, tubular body with vertical ridges on a thin stalk with two siphons - one of which points up and the other sideways or down. Orange, yellow. Or brown in color. 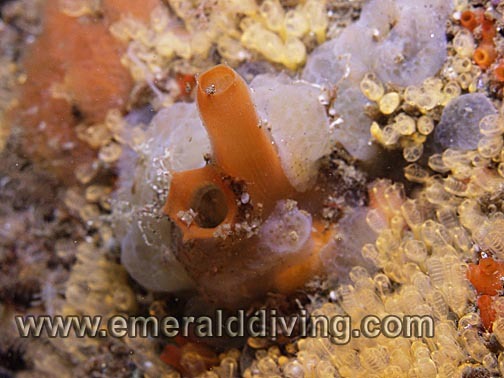 Comments: An extremely common tunicate in the San Juan Islands and Cape Flattery area. 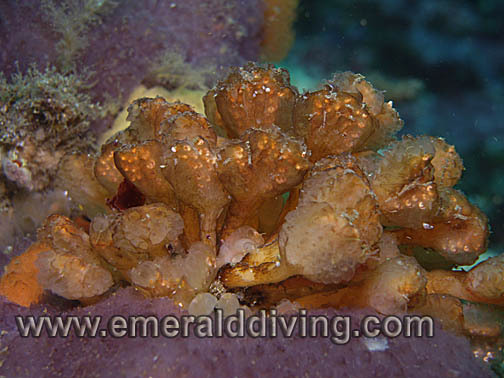 This tunicate is often overgrown with hydroids or other growths. 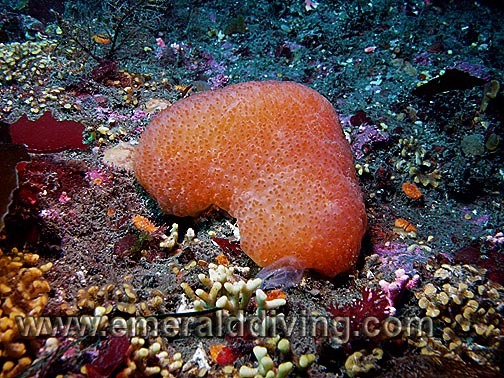 Also referred to as a Monterey tunicate. ID: Short stock, often grows in colonies. 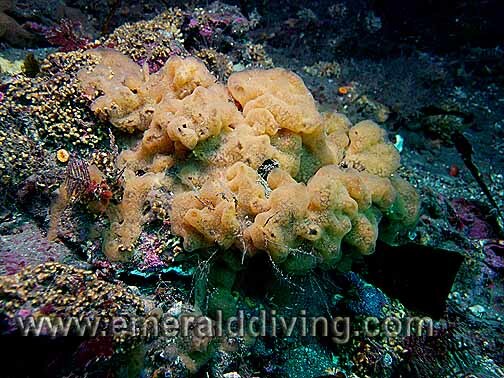 Comments: The subtle peanut sea squirt often goes unnoticed by myself and other divers. I often find in in rokcy areas sharing the substrate with kelp. Often time, I may only mote a few of thi species in an area, until I peel back some of the broadleaf kelp to reveal a rather extensive colony of peanut sea squirts. ID: Semi-transparent slender body with two siphon. Comments: Ciona savignyi is a non-resident invasive species that is has taken over certain areas and smothered other species. 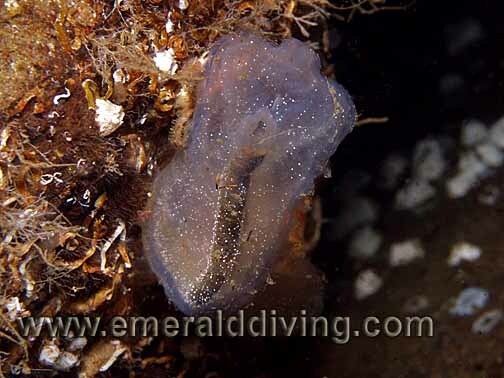 This species is must more slender than the transparent sea squirt - and not quite as transparent. 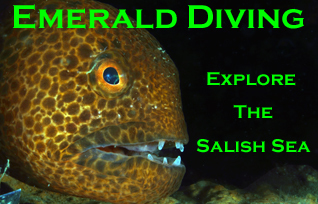 This species dominates sections of Hood Canal. Photo taken at Flagpole Point in Hood Canal. ID: Smooth surface with an orange-pearl like luster. Short siphons retract when approached. Comments: I note the brightly colored shiny orange sea squirt throughout most Northwest waters on rocky current swept reefs. 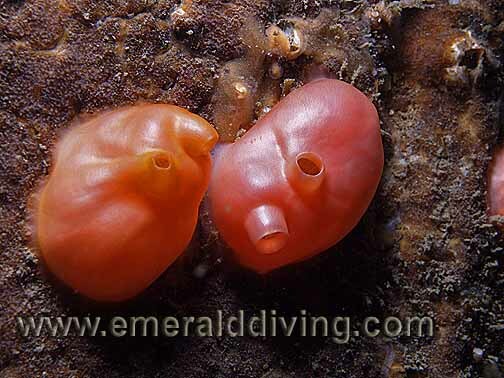 When threatened, this sea squirt will actually deflate itself and appear wrinkled. ID: Clean body with white speckles, visible brown internal organ. 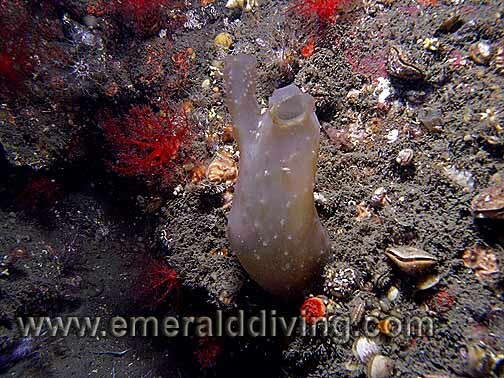 Comments: I often note the transparent sea squirt throughout Northwest waters firmly attaced to rock reefs. Although I am certain being transparent has its advantages, I don't think I have to tell you what the column of brown is inside this sea squirt. Seeing that alone would make me think twice about eating one. 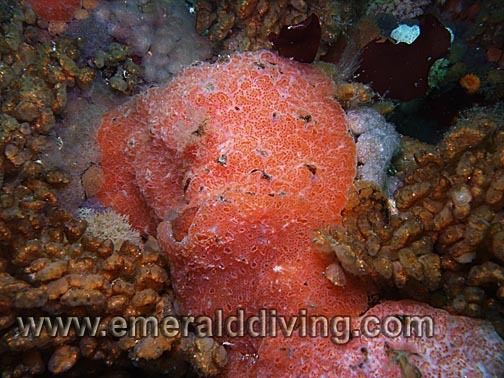 ID: Long pink siphons with body covered in art-like bumps. Comments: This little tunicate is often heavily encrusted with other members of the invertebrate family, leaving only the siphons exposed. It often seems to grow in colonies, Photographed at KVI Tower Reef in central Puget Sound..
ID: Rounded semi-transparent body. Often grows in colonies on hard surfaces. 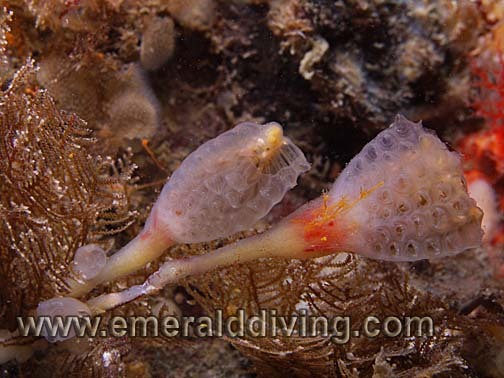 Comments: Unlike the transparent sea squirt, the digestive tract of this animal is much less obvious. I often find these tunicates growing in colonies on once side of a rock, but not the other. I suspect this has to do with current. Photographed at Edmonds Underwater Park in Puget Sound. Comments: Orignally, we thought this species might be a new speices of Distaplia. However, examination of this specimen by Dr. Gretchen Lambert revealed it is indeed Distaplia smith. Photographed on Long Island Wall in the San Juans. Unlike the fields of this ascidian that I find in the Cape Flattery area, the Long Island specimens are found much deeper. ID: Long stalk with bulbous end. Grows in aggregations. Comments: Not an ascidian that I note very often in the Puget Sound area. Photograghed off Brooks Peninsula, Northwest Vancouver Island. ID: Compound tunicate with many mushroom-like top that are connected at the stem. Red to reddish-orange in color. Grows in dense aggregations. 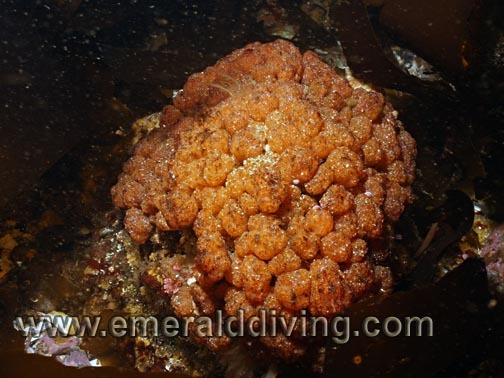 Comments: This tunicate is prevalent in part of north Vancouver Island. Photographed at Solander Island or Brook's Peninsula. Comments: Sea peaches are a relatively rare occurence in Northwest water, although I do occasionally find specimens in areas subjected to mild currents. 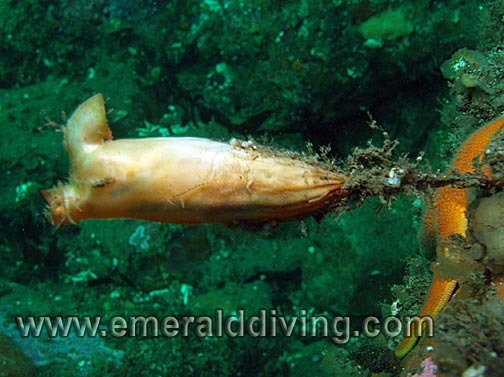 This specimen was photographed in Esperanza Inlet in British Columbia. 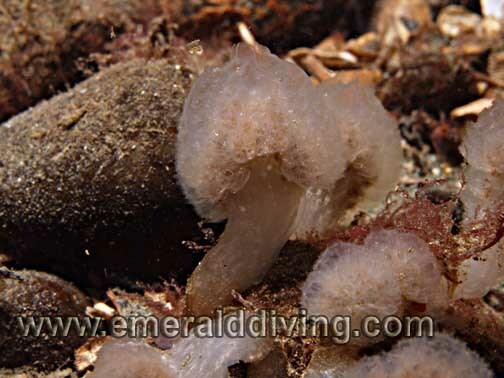 ID: Low profile tunicate with intake and exhaust orifaces. Distinctive flexible bristles enimating over entire body. Comments: This hydroid can be so laden with slit that it is hard to recognize. Photographed here in the clear waters of Browning Pass in BC.